Inventory We are a resale marketplace, not a box office or venue. Ticket prices may exceed face value. This site is not owned by Charlotte Metro Credit Union Amphitheatre . 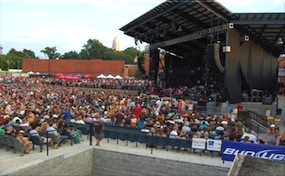 The Charlotte Metro Credit Union Amphitheatre is the smaller of the two outdoor venues in the Charlotte metro area. The Charlotte Metro Credit Union Amphitheater box office is located at 1000 NC Music Factory Blvd in Charlotte, North Carolina. Former names for the Charlotte Metro Credit Union Amphitheater include the Road Runner and the Time Warner Amphitheater. The venue is open for the summer concert months and tends to get the shows that do not go to the Verizon Wireless Amphitheater in Charlotte. Charlotte Metro Credit Union Amphitheater tickets have included events like the Jonas Brothers, Bob Dylan, Smashing Pumpkins, O.A.R., Needtobreathe, and many more. AmphitheaterCharlotte.com is not currently affiliated with any official website, box office, and or supplier. We are a privately owned and operated company that specializes in all online resale of events in the secondary market. Ticket prices on our sites may be well above or below face value and have a tendency to change quickly with market conditions. To order tickets to all Charlotte Metro Credit Unoin Amphitheater Charlotte events please follow the steps online through checkout.